One of the most entertaining message films, Shri 420 probes the eternal moral battle between virtue and sin. It delves into the corrosive effect of the bright lights of a big city on a simple soul. It has also been an inspiration for numerous films like Raju Ban Gaya Gentleman and the recent Bas Itna Sa Khwaab Hai. Kapoor's Chaplinesque protagonist Raj is full of life and good cheer. Rushing to greet a new life, he sings Mera joota hai Japani, a song which, in the Fifties, became almost anthemic in its popularity. Raj reaches the promised land, Mumbai. He finds the streets of the city are not, after all, paved with gold. Reality bites Raj as he finds his prized BA degree and his medal for honesty almost worthless. True, Raj encounters the love of the common people --- especially from Lalita Pawar (Ganga mai), who is taken by his naivete. But broken and disheartened, he soon has to pawn his honesty medal. He meets Vidya (Nargis) who --- in a dramatic gender role reversal --- saves him from drowning. Vidya is a teacher with ramrod-straight morals. Love blossoms between the two guileless souls as they share a saucer of tea and duet to Pyar hua iqrar hua. Raju takes on a lowly job at a laundry and strives to make a future for himself and Vidya. On the job, he meets haughty bombshell Maya (Nadira), who opens up another, very different world for him. The heroines are both symbolically named: Vidya represents knowledge while Maya represents the ephemeral pleasure of all desires. Maya feels Raju's ability with cards could be his gateway to big money. She transforms Raju into a fake prince and, along with a grasping capitalist (is there any other kind? ), Seth Sonachand, makes Raju a materialistic card sharp. Raj's morals are the first casualty at the lure of easy money. His love for Vidya threatens to be second. He takes her to his club; she recoils and runs away. Raju's attempts to follow are thwarted by Maya who admonishes him with Mud mud ke na dekh mud mud ke. Vidya's Jaane wale mudke zara dekh ke jaana falls on seemingly unheeding ears. The divide between the two lovers runs deeper when Raj gets involved in a get-rich-quick scheme endangering other people's money. Sonachand and Maya or Vidya? Shri 420 can be seen as an allegory for the choices before the still-innocent, newly-independent citizens of India. Noted writer K A Abbas writes another socio-realist story (along with V P Sathe) after Awara for Raj Kapoor. The latter laced it with Shanker-Jaikishan's catchy tunes, Shailendra and Hasrat's lyrics and narrated it with humour and depth of feeling. 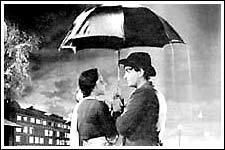 Kapoor also displayed unique ability in investing the romance between Raj and Vidya with lyricism. The two-lovers-under-an-umbrella magic of Pyar hua iqrar hua is still potent. Kapoor also adeptly evokes Raj's gradual disillusionment with the siren call of non-ethical materialism. In Ramaiya vastavaiya, when Nargis is mourning her loss [Tu aur tha tera dil aur tha, tere man mein yeh meethi katari na thi], a conflicted Raj finally joins in towards the end with his lament [Kaun jo mujhko kahe, maine dil tujhko diya]. The perfromances help the film's endorsement of ethical living and high thinking. Nargis' quiet demeanour in the film contrasted with Raj Kapoor's flamboyance. Nadira's laquered, diamond-studded character comes across as a beacon of danger, with her eyes flashing fire and brimstone. Kapoor is the soul of innocence, with very human failings. You believe in his journey from an agitated striver to a man who finally rediscovers his finer self. * A special film as it was Nargis' last under Raj Kapoor's direction. She did one more for R K Films, the Shambu Mitra-directed Jaagte Raho --- though only in a special appearance in Jaago Mohan pyaare. * Nadira's seductress gown for Mud mud ke na dekh was stitched so tight she couldn't sit down. The agony was worth it, she says: "Even today, at the racecourse, people sing the song when they see me." * Nadira's smoking in the film with a cigarette-holder became a fashion statement. The veteran actress maintains she has never smoked in real life. Nadira became Raj Kapoor's rakhi sister during Shri 420. * Sadhana faced the camera for the first time as a group dancer for a song in the film. * A time when Mukesh was busy with his own acting career (he was hero opposite Usha Kiron in Anuraag, 1956). The success 'voice' for Raj Kapoor in the director's earlier superhit Awara, Mukesh sang only Mera joota hai Japani, Ichak daana and a small stanza in Ramaiya vastavaiya for Shri 420. * The talented Manna Dey benefitted most. He sang the classic Pyar hua iqrar hua besides Dil ka haal sune dilwala and Mud mud ke na dekh. * If Shailendra wrote simple, meaningful lyrics in Mera joota hai and Ramaiya vastaviya, Hasrat excelled with Ichak daana. Lata was Shanker-Jaikishan's first choice for heroines' songs then and she sang all the Nargis numbers. * A still-struggling-for-her-niche Asha Bhosle sang Mud mud ke na dekh --- one of her first hit songs. It helped build her image for saucy numbers.